Dimensions: 35 mm. diam. overall length of bracelet approximately 190 mm. One of the most attractive time-only Rolex watches to be offered at auction recently, the present watch not only boasts the super-desirable “honeycomb” dial but is further enhanced by star indexes with luminous centres. This bewitching combination makes it one of the rarest Rolex wristwatches from the early 1950s. Furthermore, the dial has remained completely untouched over the past 65 years so that today it impresses as a stunning and pure example of the reference. Within the reference 6098 Rolex family, examples fitted with the highly appealing honeycomb dial and with the sought after star-shaped numerals, more commonly associated with the celebrated “stelline” reference 6062 made during the same period, occupy a very special position. According to our research, including the present watch, a total of only eight reference 6098 are known publically with a gold case and silvered “stelline” type dial. Three examples are known in gold with black dial and three examples in steel with silvered dial. The serial numbers of all the known examples in gold fall between 912*** and 947***. Launched in the early 1950s, reference 6098 is blessed with the largest Oyster case of the period made by Genex S.A.
Another interesting aspect of the present watch is that is has the very unusual feature of a copper-colored gilt movement. Several of the known “stelline” type reference 6098 watches have movements of this special colour. Furthermore, the interior of the caseback is “double signed” that is, in addition to the large Rolex Geneva Swiss Patented signature and logo there is a further signature Montres Rolex S.A., Geneva, Swiss engraved vertically. The combination of copper-coloured gilt movement and the double signed caseback has led to speculation that a number of reference 6098 watches that share these features may have been used for a special purpose such as for exhibition. Another reference 6098 in gold with black star dial also with copper-coloured gilt movement and double signed caseback is illustrated in: 100 Superlative Rolex Watches, John Goldberger, p. 38. 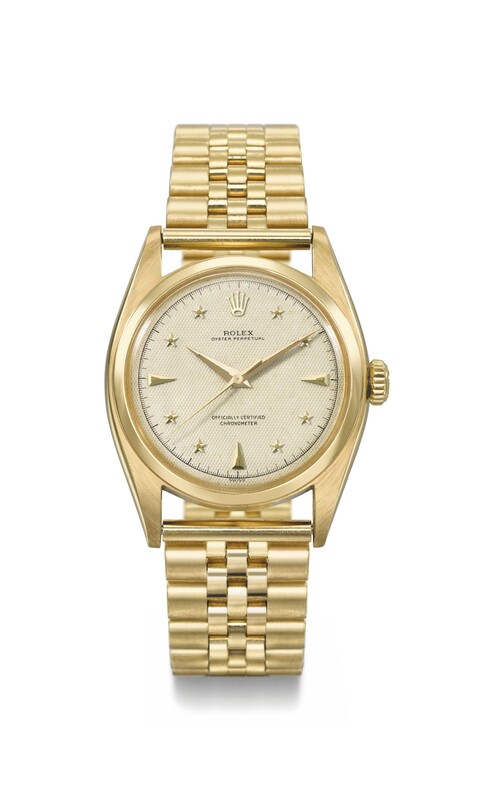 "Only eight examples known in yellow gold with silvered star dial"